I started this sweater in the summer. It was almost finished, and then I was worried that it was too short, and that I would never wear it. It ended up in a ziplock bag until yesterday, when I needed a short sweater. I have recently gotten back into sewing, and found a pattern for and made a little green dress. The bodice (I think that’s what it is called) is short, and when I tried a normal length sweater over it, the skirt rumpled up kind of funny. 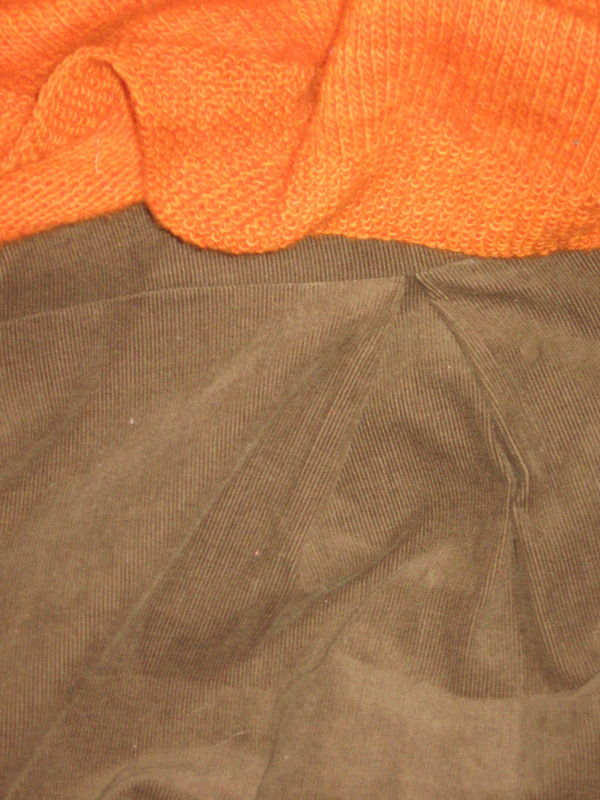 I dug into the knitting pile in my spare room this morning, found the unfinished orange sweater, tried it on, and it worked just about perfectly! 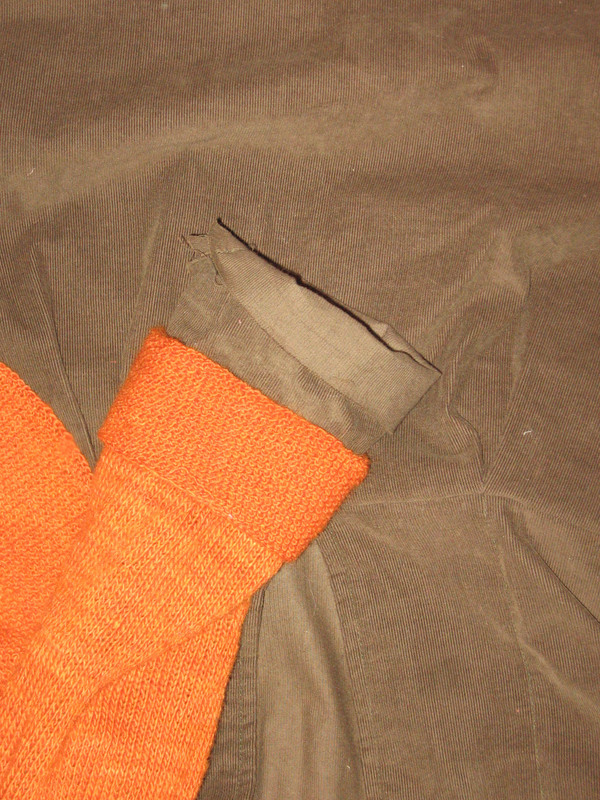 The sweater sleeves are a little bit tight over my arms and the corduroy sleeves, but I think that I can manage, and maybe the wool will stretch a little. The sweater is knit with Malabrigo lace weight yarn. I ended up using a little over two skeins of yarn, so have a bit left for another project…I knit the sweater on size six needles, starting at the top and knitting down. 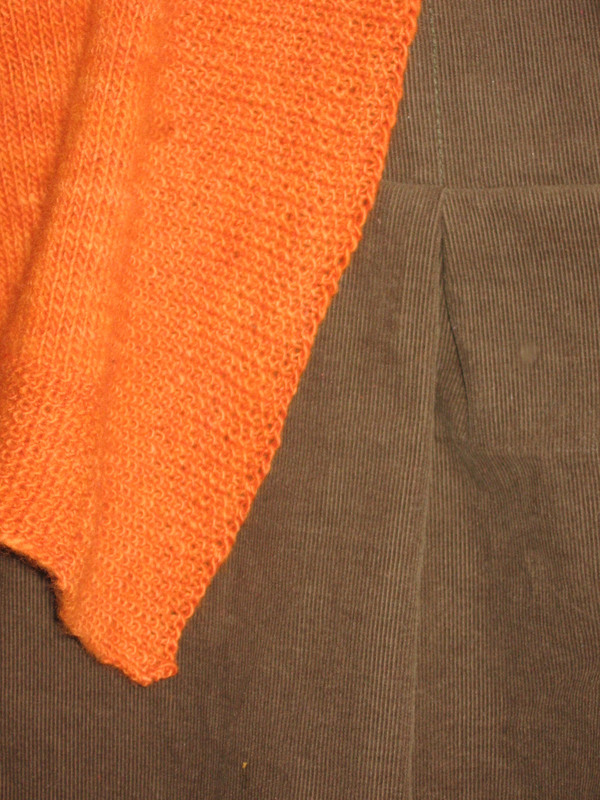 I added seed stitch at the bottom, sleeve edges, and around the front, instead of ribbing and stockinette. When I picked up stitches around the front, I think that I picked up a few too many at the bottom. The border extends down, making little points. I am actually growing used to them though. The seed stitch (on size two needles) was taking so long, and I didn’t feel like ripping it out, so I kept it. The good thing about using such thin yarn is that you get a more delicate sweater, and it costs less. 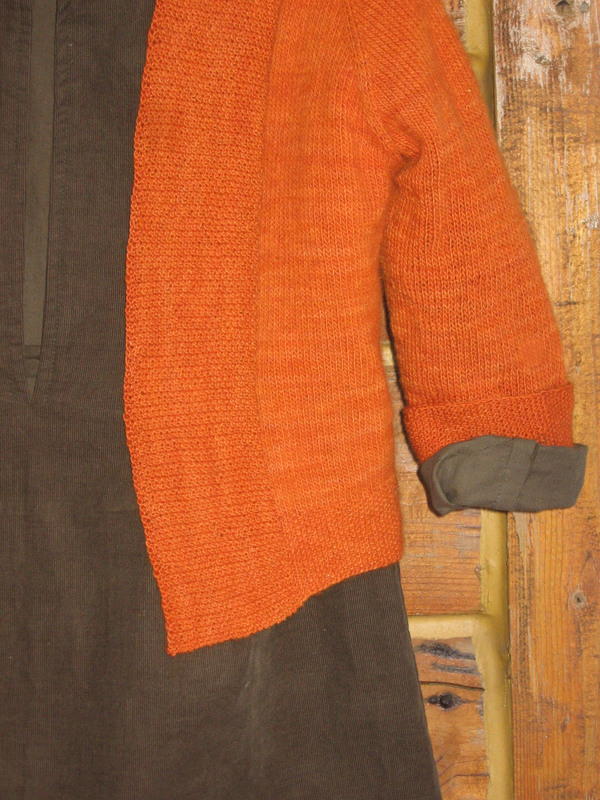 The three skeins of yarn cost about $8.20 each, so the total sweater cost was around $25.00. Not too bad if you ask me! The dress was from a pattern that I picked up in Iowa City. I also purchased some pretty fabric to go with the pattern, but as of yet am unable to cut it. (I have a hard time cutting into new pieces of fabric.) 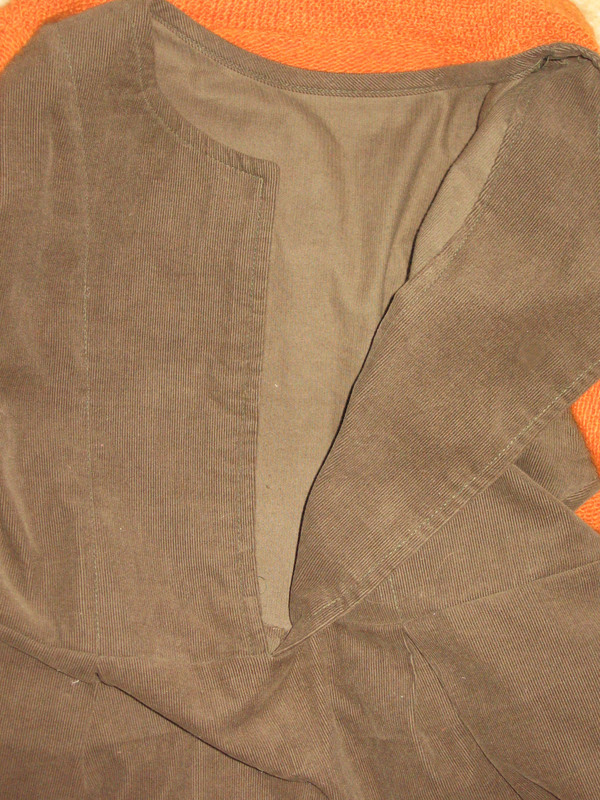 I had some fine whale green corduroy (already washed and dried) sitting around, and used it to make a prototype. 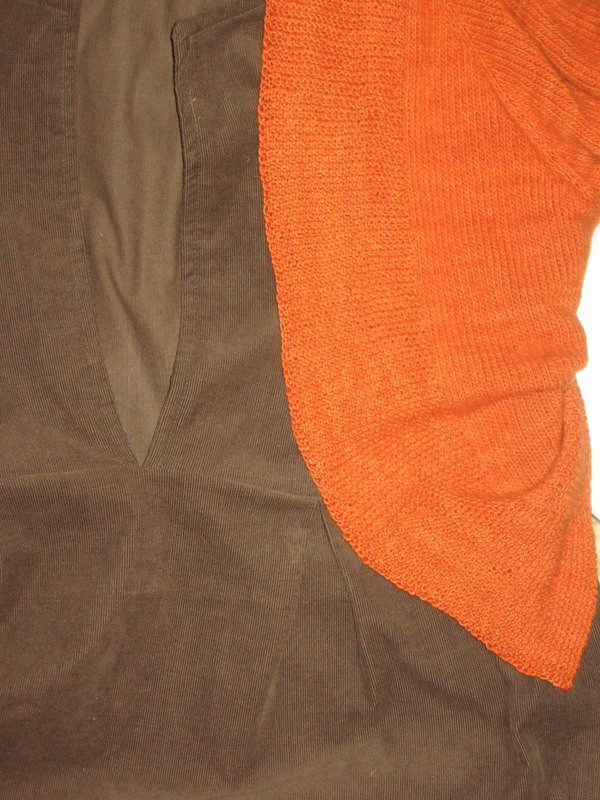 The front is made up of two pieces, with plackets on the back side (shown above). It is a simple, effective design. No buttons or other fixtures used! The back is one piece, and I very slightly gathered the sleeves and sewed them in once the front and back were attached at the shoulders. 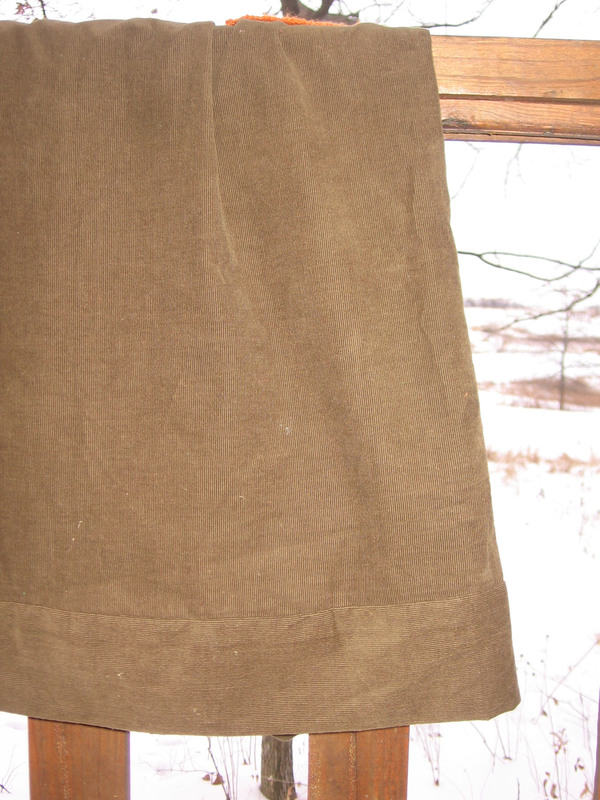 Then the skirt front and back. With reverse box pleats. Two in the front and one in the back (below). When I tried the dress on to show my mom, we decided that we liked it longer, and she had the thought to run a band around the bottom to add a few inches. I tried this and liked it. The material is going in the opposite direction, and it creates a nice edge effect. That’s about it. A quick and easy sewing project. I am happy with the fit, and am planning on making another one with my new fabric…maybe over the weekend. I had forgotten how fun sewing can be. And it goes very quickly, which is quite satisfying!! Uber cute sweater and super cute dress!! !